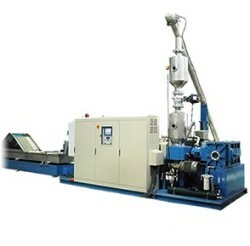 Manufacturer of Plastic Recycling Extruding Machine. Based on expertise technique, KOWIn designs and manufactures the extrusion-pelletizing line in aspect of customer and operator. A production line of low power consumption, high capacity and easy-operation, it allows customers to produce high quality recycled pellets. KOWIn continues researching and developing updated machines for customers. * Very low ampere when in full production. Energy-saving. * This system is researched and developed through several years; it solves the biggest difficulty of material feeding for extruder. This system is world-wide patented, from Japan, China, Taiwan, Germany and other countries. * Patented by several countries ; counterfeit will be prosecuted. * Welcome to KOWIn for test-run ; international OEM requirement is welcome, too. pelletizing by 10 % more. 3. Reduce the problem of the material not feeding. 2. Not only for industrial waste, but also for Post-consumer waste. 3. Especially for fluffy material. ✽ Capacity is depending on polymer properties and system options. ✽ Detailed specification based on inquiry and discussion.